Bleeding Light is a collection of ghazals tracing the steps of a woman’s journey through night. In order to witness dawn, she must travel through dusk first. Throughout her journey, she is caught between West and East, religion and heresy, love and anti-love, darkness and the knowledge of light. Each couplet of a ghazal is an independent thought and reflection, a pearl strung into a necklace. Bleeding Light is fraught with opposing, stark, and often violent imagery heavily influenced by Sufi philosophy. "Very rarely do you see a writer of this caliber, through a Sufi lens she speaks of the journey of a devout soul from the darkness, shadows and the blackening of night, to the inner illumination, radiance and beauty of day. Through her keen eye on historical scenarios, and creative form of ghazal, she did not only awaken a field of gazelles, she has brought ease and ecstasy in my very being..."
"In my humble opinion, the best Ismaili Muslim poet in the world today. Seldom have I read poetry that makes me feel like I'm traveling across a spiritually charged landscape, where I don't know whether my feet are touching water or land. Or is it both?" "Sheniz Janmohamed is one of a very few new poets who has mastered the form of the ghazal in a way that brings together the emotional aspects of the form and the expectations of the listeners who know the form and its cultural unity: mystic illumination, rhyme, refrains that exude passion, and couplets with wise insights. The couplets in her eloquent and appealing ghazals dazzle one with their precision, sudden turns and brilliant use of the cultural memory of language and imagery." "This profound, spellbinding complilation sends shivers down my spine!" 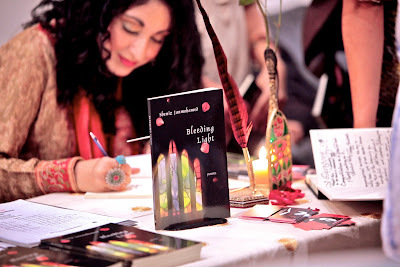 "Bleeding Light is a beautiful compilation of contemporary Sufi poetry that combines creative imagination with artistic majesty. These ghazals of Sheniz Janmohamed bring to light an all too often forgotten classical poetic sensitivity of longing for the Divine and praising the arrival of the Beloved. It is my hope that these poems find wide readership for such beauty will enrich the lives of those who contemplate the visions within them." - Meena Sharify-Funk, Ph.D, author of Encountering the Transnational: Women, Islam and the Politics of Interpretation, Assistant Professor of Religion and Culture Department, Wilfrid Laurier University. "(I) have been going through the collection several times to grasp the imagery, the juxtaposition of images, thoughts, the use of words in most unusual contexts and have found them to be very profound, an insight into the complexity and depth of Janmohamed's spiritual/emotional involvement and development." "Bleeding Light is a true masterpiece! One of the most brilliant & genuine writers/poets/artists of our time. Reading & listening to Sheniz's work makes my soul vibrate. Her words parted Time and Space... I did not read words, I read Worlds. I have seen none other, live and watch their death so closely, but still stay alive." "Just received Sheniz's book, was up all night reading it. It is one the most beautiful poetry books I have ever read. I congratulate her on this masterpiece. It will always be at my bedside." " ...a masterfully-woven story - is an incredible accomplishment by one so young. Her poetry is pure velvet - a confluence of light and dark reflecting the trials of love and the test of faith. The story in the poetry is terrifying as her character must make her way in the darkness of the night. As the journey progresses, the poetry appears to intensify, going deeper into the human condition and its connection to the Divine in some of the most beautifully-crafted lines I've ever read. As I was reading, my body was in a state of wonder and suspense - a feeling of urgency and discovery, and even discomfort because that's how we see the layers behind the layers. Haunting self-discovery. That's what I felt. What a remarkable work of creation by a remarkable young woman."